(CNSNews.com) - The U.S. Food and Drug Administration signed a new contract on July 25 to acquire “fresh” human fetal tissue to transplant into “humanized mice” so that these mice will have a functioning “human immune system,” according to information published by the FDA and the General Services Administration. 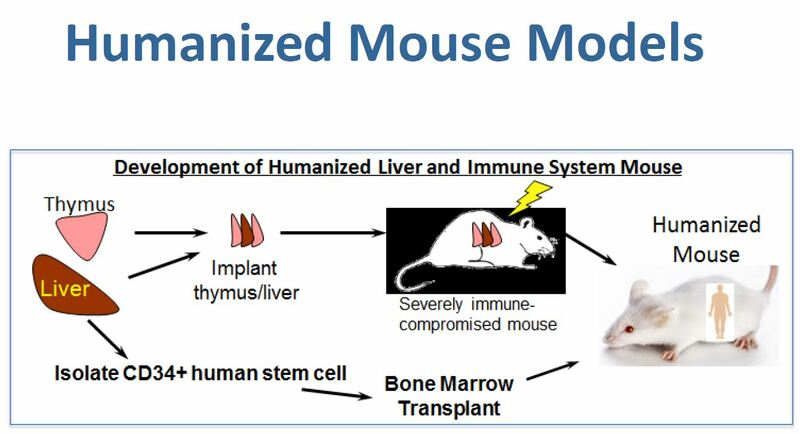 The above graphic depicting the creation of a humanized mouse was included in a November 2016 FDA presentation posted on the FDA's website. --The total number of babies expected to donate their tissue to the FDA to create humanized mice during the year-long duration of the contract. --Whether the FDA needed to know that the abortion of a donor baby was taking place so FDA researchers could be prepared to implant this baby’s “fresh” tissue into mice in a timely manner. --Whether there were any methods of abortion that could not be used to terminate the babies whose tissue would be used by the FDA to create humanized mice because that method would cause the tissue to be damaged or spoiled in a way that would make it unsuitable for this research. “The U.S. Food and Drug Administration is committed to ensuring that its research is conducted responsibly, conforms with all legal requirements, and meets the highest ethical standards,” said the FDA statement. “At the FDA, research involving human fetal tissue accounts for a very small fraction of the FDA’s total research and has been used in situations where it is critical to understanding how the human immune system responds to certain drugs and biologics,” the statement said. “This work has led to a better understanding of a number of conditions and diseases that affect millions of Americans. “The FDA’s researchers obtain fetal tissue from a non-profit Tissue Procurement Organization (TPO) that have [sic] provided assurances that they are in compliance with all applicable legal requirements, including relevant provisions relating to research involving human fetal tissue,” said the statement. “FDA is not involved in the TPO’s sourcing of the tissue,” it said. This screen capture from the GSA database listing of the contract that the FDA signed with ABR on May 10, 2016 has as the description of requirement "Human Fetal Tissue (Liver/Thymus)"
The FDA’s June 13 presolicitation notice contended that Advanced Biosciences Resources was the only organization that could fulfill the new contract. “ABR is the only company in the U.S. capable of supplying tissue suitable for HM research. No other company or organization is capable of fulfilling the need,” the FDA notice said. “The government intends to solicit and negotiate directly with Advanced Bioscience Resources (ABR) Inc., and no solicitation will be issued,” it said. “The objective is to acquire Tissue for Humanized Mice,” it said. CNSNews.com sent ABR the same set of questions it asked the FDA. However, ABR did not respond. In investigative reports published in December 2016, the Senate Judiciary Committee and the House Energy and Commerce Committee’s Select Investigative Panel on Infant Lives discussed ABR’s actions in providing researchers with human fetal tissue retrieved from aborted babies. These actions included having ABR technicians working inside abortion clinics operated by Planned Parenthood affiliates. “For the period covering 2005 to the present, ABR informed the committee that it obtained fetal tissue from two Planned Parenthood affiliates, as well as from seven other independent clinics,” said the committee report. For example, a group of scientists from the FDA’s Division of Applied Regulatory Science (DARS) published an article in Therapeutic Innovation & Regulatory Science on July 21, 2017 that discussed the FDA’s use of humanized mice engrafted with human immune systems like the mice described in the FDA’s contract notice. 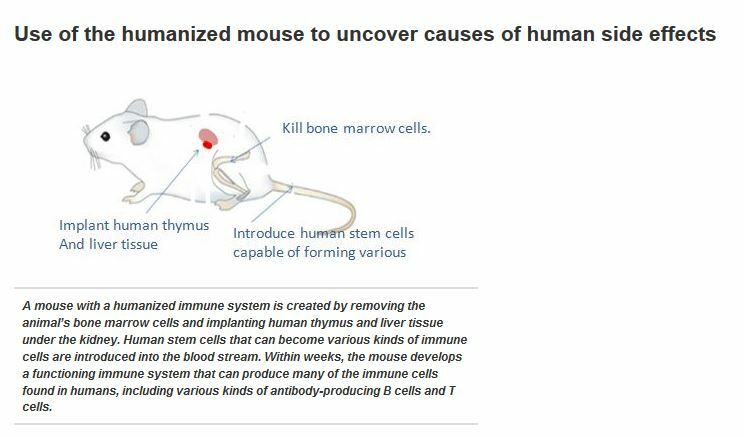 The FDA published a similar graphic in an internal presentation made in November 2016 that included a section on the FDA’s use of “Humanized Mouse Models.” Yet another similar, if simpler, graphic is posted on the FDA's website. This graphic of a humanized mouse is posted on the FDA's website. As previously reported by CNSNews.com, government researchers working for the National Institutes of Health created similar “humanized mice” using livers and thymuses taken from babies aborted at 17 to 22 weeks gestational age. These NIH researchers published an article in the Journal of Immunological Methods that indicated that Advanced Bioscience Resources—the FDA’s fetal tissue contractor—had provided them with the livers and thymuses they needed to make their humanized mice. The NIH scientists said in this journal article that they “routinely produced cohorts of approximately 40” humanized mice “from a single tissue donor”—n.b. a single aborted baby. At a Sept. 24, 2007 workshop sponsored by the NIH—“The New Humanized Rodent Model Workshop”—a federally funded scientist described a type of humanized mouse given a human immune system by implanting it with “human fetal liver and thymus” taken from babies who were 20 to 24 weeks gestational age. The federally funded scientist indicated at this NIH workshop: "A single donor provides sufficient tissue to implant 50–60 mice." In fiscal 2018, the NIH—which is a separate entity from the FDA but also a part of the Department of Health and Human Services--estimates it will spend $103 million on human fetal tissue research. In fiscal 2017, it spent $98 million. On Sept. 14, 2017, the House of Representatives passed an omnibus appropriations bill that included language pushed by Rep. Martha Roby (R.-Ala.) and other pro-life House members that would have prohibited federal funding of research that uses tissue from aborted babies. This language, however, was not included in any of the spending bills that ultimately passed the Senate and were signed into law for fiscal 2018. In July, the House Appropriations Committee approved a bill to fund the Department of Health and Human Services for fiscal 2019. That bill—like last year’s version--includes language that prohibits federal funding of research that uses human fetal tissue obtained through an abortion. For that language to become law, however, it would need to be included in a funding bill that is passed by both the House and Senate and signed by President Donald Trump.